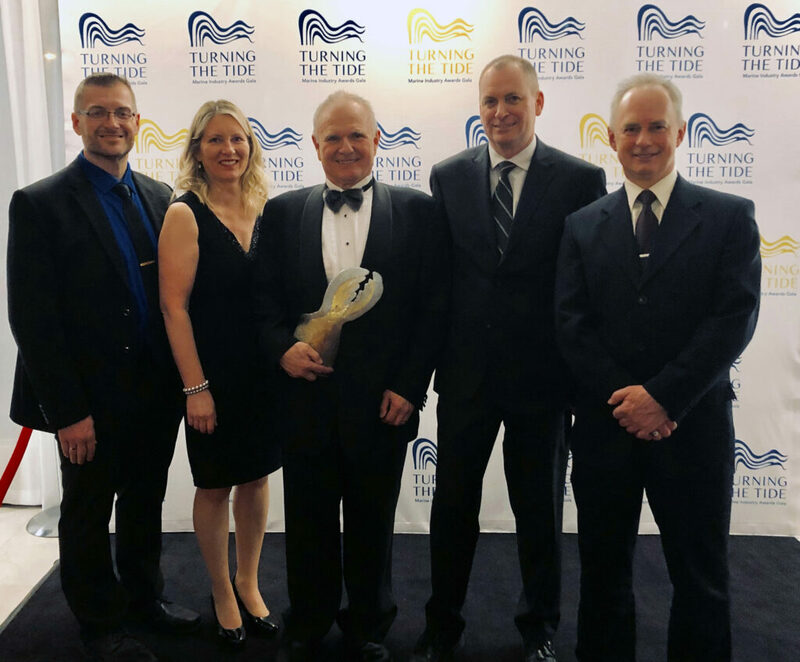 At the Turning the Tide Marine Industry Awards Gala in St. John’s, NL, Fraser Edison was honoured for his contributions and leadership in the marine industry in Newfoundland and Labrador. Mr. Edison, president of Rutter Inc., accepted the Industry Lifetime Achievement Award. This annual award celebrates an outstanding individual who has demonstrated exemplary leadership and contributed to the betterment of his or her industry. April 5, 2019 – Last evening, at the Turning the Tide Marine Industry Awards Gala in St. John’s, NL, Fraser Edison was honoured for his contributions and leadership in the marine industry in Newfoundland and Labrador. Mr. Edison, president of Rutter Inc., accepted the Industry Lifetime Achievement Award. This annual award celebrates an outstanding individual who has demonstrated exemplary leadership and contributed to the betterment of his or her industry. Mr. Edison’s career in the marine industry includes extensive experience in finance, construction, oil & gas, and transportation management. He was involved in a joint venture that built the Gravity Based Structure for the Hibernia Project, and the Terra Nova Floating Production and Offloading System for Petro-Canada. His international marketing skills have contributed significantly to local industry growth in the global arena, gaining partnership recognition and contracts outside Canada with firms such as Brown and Root (USA), DORIS Engineering (Paris, France) and Vinci Corp (France). As Rutter Inc.’s President, Mr. Edison has had his hand on the wheel as this innovative marine technology company navigated its way to become a major player in the global specialty radar market with a presence in more than 40 countries. Rutter has achieved significant market growth under his leadership. Despite his early and continuing success, Mr. Edison actively sought out ways to give back to the community. He was a founding member of the Newfoundland & Labrador Oil & Gas Industry Association (NOIA). He was a member of the St. John’s Rotary Club, and provided many years of committed service to Easter Seals, and other deserving local charities. Mr. Edison has been very active helping to build the local business community. He is currently serving as a board member of the Newfoundland and Labrador Liquor Corporation, Newfoundland and Labrador Hydro, and the Canadian Government’s AIF Advisory Board for the Atlantic Canada Opportunities Agency. He is a former president of St. John’s Board of Trade, former chair of St. John`s International Airport Authority, the Genesis Centre Selection and Review Board and the Research and Development Corp., a Crown agency. Mr. Edison has also received provincial and national accolades. He was awarded the Government of Canada Medal 125 for achievement in community service. He was also awarded the Queen Elizabeth II Diamond Jubilee Medal. NOIA has singled him out for the Outstanding Contribution Award. As well, he is proud of his induction into the Junior Achievement Newfoundland & Labrador Business Hall of Fame. They credited him with outstanding leadership and an innovative approach to business that has had such a positive impact on the economy. Industry Leadership and Excellence Award – Oceanex Inc. Innovation Leadership Award – Kraken Robotics Systems Inc.
Rutter Inc’s signal processing, recording, and playback capabilities integrate with navigational or dedicated-purpose marine x-band radar assets to provide enhanced situational awareness. This technology helps promotes safety, security, and efficiency in the challenging marine environment. Signature products include the sigma S6 Oil Spill Detection, sigma S6 Small Target Surveillance, sigma S6 Ice Navigator™, and the sigma S6 WaMoS®II Wave and Surface Current Monitoring systems. Vice President – Rutter Inc. This week Rutter staff celebrated the twentieth anniversary of the company with corporate events at their head office in St. John’s. St. John’s, NL – This week Rutter staff celebrated the twentieth anniversary of the company with corporate events at their head office in St. John’s. In 1998, Rutter was incorporated to meet the emerging demand for Voyage Data Recorders (VDRs) and general manufacturing engineering services. In 2003, Rutter expanded its product offerings to include the sigma S6 line of specialty radar processing systems, where the company maintains its focus today. In 2012, Rutter acquired OceanWaveS GmbH of Germany, adding their WaMoS II radar-based wave and surface current measurement technology to the sigma S6 portfolio. Over the past twenty years, a combination of innovative product development, customer engagement & service, and strong Canadian management has resulted in industry-leading radar technology. The sigma S6 suite, which spans ice management & navigation, oil spill detection, small target surveillance, and wave & surface current analysis, is recognized globally as an essential component of specialized marine operations. Rutter Inc. has released the latest update to the Rutter sigma S6 product line, version 9.2.0. This new version is being released for general availability this week. It is also available as an upgrade on existing systems for qualifying customers. Rutter’s proprietary radar data processing system interprets data from both conventional marine navigational and coastal surveillance radars, providing enhanced radar imagery and state of the art detection, tracking, and measurement capabilities. The sigma S6 suite includes the sigma S6 Ice NavigatorTM, sigma S6 Small Target Surveillance, sigma S6 Oil Spill Detection system, and sigma S6 WaMoS® II Wave and Surface Current system. After extensive testing, the sigma S6 WaMoS®II Wave and Surface Current Monitoring System was re-certified by DNV-GL in May of this year. The system was certified compliant with IEC 60945 Ed. 4 (2002-08) maritime navigation and IEC 62288 Ed. 2.0 (2014-07) radio-communication equipment and systems for Wave Monitoring Systems. HOVIK, NORWAY, August 23, 2018 – After extensive testing, the sigma S6 WaMoS®II Wave and Surface Current Monitoring System was re-certified by DNV-GL in May of this year. The system was certified compliant with IEC 60945 Ed. 4 (2002-08) maritime navigation and IEC 62288 Ed. 2.0 (2014-07) radio-communication equipment and systems for Wave Monitoring Systems. The sigma S6 WaMoS®II Wave and Surface Current Monitoring System provides real-time wave and surface current measurements using standard navigational radars as a sensor. The operator is able to effectively identify environmental conditions and safe operational windows with the help of high definition images of wave fields and intuitive graphical reporting. DNV-GL is a globally recognized quality assurance and risk management company. Driven by the purpose of safeguarding life, property, and the environment, they enable their customers to advance the safety and sustainability of their business. They provide classification, technical assurance, software and independent expert advisory services to the maritime, oil & gas, power and renewable industries.